The redevelopment of the University’s Sports Centre, will create an iconic new sports building that integrates with the existing world-class facilities on the site, including the national tennis and swimming academies. 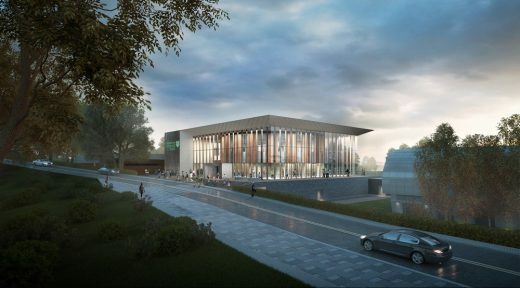 The new building will provide an animated entrance gateway to the sports centre and includes purpose-built studios, an innovative fitness suite, three-court sports hall, indoor cycling studio, strength and conditioning area, as well as a new state-of-the-art high performance suite. Users of the new building will also benefit from enhanced changing facilities and communal spaces. The site is set within a rich landscape located around Airthrey Loch, overlooked by the National Wallace Monument and with views to Stirling Castle, Airthrey Castle, the Ochil Hills, Ben Lomond and the Trossachs. A considered approach to the design process has ensured the redevelopment improves the character and appearance of the sports campus in a way that is sensitive to the quality of its setting. 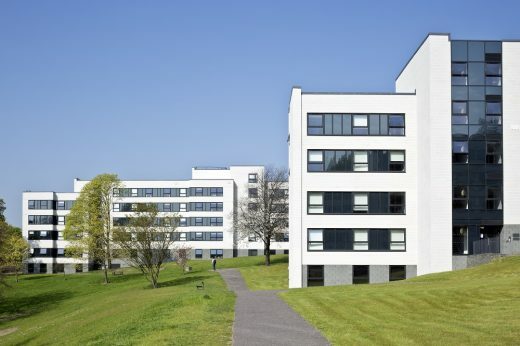 The main building responds to the site at three levels – the lower story creating a robust base with linkages to the existing swimming academy and sports hall, and the two upper levels establishing a relationship with the street and surroundings. The double height volume housing the café and social spaces affords the building a civic quality which supports its ambition for transparency and inclusivity. The building’s glazed frontage exposes a central cylindrical drum that acts as a welcoming focal point. Vertical timber fins—spaced to create a concertina effect—present the illusion of motion. The fitness suite contained within the drum, animates views from the main approach routes.